High up on the roof of the Chichester Festival Theatre a solitary Fiddler is playing. Below, milling outside the theatre in the warm late afternoon sunshine, we theatre goers listen spell-bound. It is the perfect introduction to the production we are about to see. 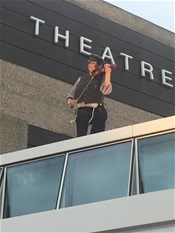 Fiddler on the Roof, that is, what else? The Youngest of the Darling Daughters and I had booked our tickets some months ago but at the time I didn't realise I would have another visitor in the welcome shape of grandson Jack. Could I wangle another ticket for him, I wondered, so that he could join his mother and me on our latest Theatre Date? On-line booking wasn't promising: the Tuesday evening performance, being Press Night, was fully booked. However, the sweet woman in the Box Office, whom I telephoned first thing on Monday morning, was cautiously encouraging - nothing doing at the moment, she confessed, but she suggested I should just keep trying, hoping to strike it lucky with a return ticket. Well, you know me. Persistence is my middle name. You thought it was Anne, didn't you? Throughout Monday, I phoned the Box Office until finally, at 7 p.m. I struck gold. There was a ticket available on the back row, slightly to the side of the stage but no restricted view. Would I like it? At just a tenner? My excitement when I related my success to my grandson was at fever pitch. He so deserved a treat, my Jack. His three day stay with his Grandad and me could not have been more different from those Days of Yore, when the activities on offer would include go-karting, swimming, the Amusement Park and a thrill-packed ride on the Action Boat. This time round, I warned him, the greatest excitement I could offer him was helping me transport his Grandad to the dentist on Monday afternoon. Almost as thrilling would be the trip via Dial-a-Ride to Guild Care where his Grandad would enjoy an assisted bath. Jack was quite unfazed and Stalwart in His Support. Bless him! Could he help me, I asked, work out the Scores on the Doors for the final meeting of our Nomination Whist group where I would need to announce the player with the highest average, the most improved, the highest score? I produced a large sheaf of score sheets and explained we would need to add up each player’s scores since the beginning of 2017 before working out their averages. “I’ll set us up a spread-sheet!” Jack announced. Now why didn't I think of that? This is another thing I love about Jack - he never patronises, never makes me feel even a little bit foolish. He simply, matter of factly, sets about getting things done. We did spend a lovely chilled evening watching “Apollo 13” and sharing a bottle of rosé wine which he had bought for us. My previous attempt to supply a bottle of the Pink Stuff, understanding it to be his Wine of Choice, went badly wrong when the wine I purchased on the advice of a young shop assistant (“It’s a young person’s drink,” she told me - so how could I resist?) turned out to be too sweet for either of us. Since when, incidentally, did my grandchildren (at least some of them) become old enough to buy the wine? Jack arrived on Sunday with his aunt, the Middle of the Darling Daughters - I would tell you all about our Seaside Day with The Trio but Faris has indicated that it is high time I handed over the Daily Blog to him again so I will leave you to look forward to that undoubted treat tomorrow. You can probably tell why I so much wanted to secure that elusive ticket for my Jack. It was a very small thank you to him for helping me out so cheerfully and for looking out for his Grandad. Not to mention the pleasure of listening to him singing to himself as he prepared for bed each night, sending me to bed happy in my turn. Fiddler on the Roof lived up to our Great Expectations with the cast receiving a well-deserved standing ovation at the end. The opening number, as you may or may not know, is the rousing “Tradition.” The Youngest of the Darling Daughters tells me this song always reminds her of me, with my long-time habit of creating and maintaining family traditions. Though, unlike Teve, I don't go around stamping my feet and waving my arms in dance.